Just when you thought Bandai could not make a more impressive Diecast.. THEY DO!! 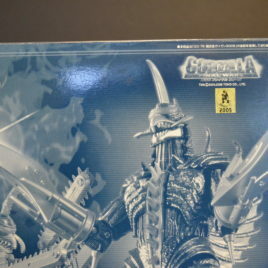 This beauty is the Toy's Dream Project LIMITED CHROME version of GIGAN 2005 from Godzilla Final Wars. Standing Approx. 7 inches tall, this highly detailed vinyl and metal Diecast is AMAZING!! The color just leaps out at you. Intricate design and articulation make this a must have for the serious Diecast collector. Gigan can be transformed into the POWER UP version with his impressive CHAIN SAW ARMS or into the FLYING STYLE GIGAN. Comes in Mint Condition in Mint to Near Mint Condition Box. Produced in very limited numbers, we were only able to get our little claws on a few of these beauties. CLAWMARK TOYS WARNING; Not suitable for young children due to small parts. Amazing SUPER SHINY Chrome version Diecast MechaGodzilla 2003 by Bandai. Approx. 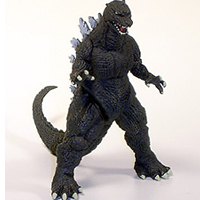 7 inches tall, Another extremely detailed, articulated diecast figure by Bandai Company. 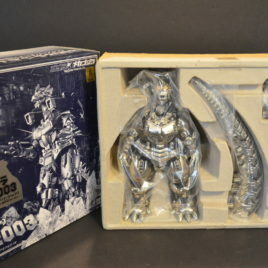 If you like MechaGodzilla 2003, you will LOVE this Awesome Diecast figure. Mint Condition in MINT Box. This figure is difficult to find even in TOKYO! CLAWMARK TOYS WARNING: NOT SUITABLE FOR VERY YOUNG CHILDREN DUE TO SMALL PARTS.